Vitamin E is a great helping hand in decelerating the aging process in the body. Additionally, it prevents the development of several diseases such as cancer, cardiovascular illnesses, and cataracts and reduces scares originated by wounds. On the other hand, this substance turns into a natural diuretic and aids the skin to keep a good aspect. The insufficiency of this vitamin can originate fragility of red blood cells and degenerate neurons. •	Reduction in blood circulation. Several factors can cause the origin of the lacking of this substance, but the malabsorption of fat is the main reason of this malady and, in newborns, low birth weight can be the principal source of it. Due to all the previous conditions, a low level of vitamin E could also generate neurological problems by bad nerve conduction. •	Diseases at gastrointestinal levels. •	Hair loss or dry hair. •	Long time for healing. The symptoms can vary according to people’s age. For instance, in little infants, the low quantity of the vitamin in the organism is reflected by retrolental fibroplasia (eye illness), weight loss, growth delay, poor eating habits, and the development of mental and physical issues. •	Chronic liver disease, with neurological problems as a side effect. •	A great lack of muscle movements’ coordination with deep tendon reflexes loss. •	Truncal and limb ataxia. •	Damage to vibration and position senses. •	Paralysis of the muscles in charge of eye movements. •	Drooping of the upper eyelid. •	Disorder in the speech. •	A slowing development in growing. •	Problems link to reproduction and infertility. •	Weakening of red blood cells. •	Abnormalities in the function of several parts of the body such as muscles, liver, bone marrow and brain. To avoid the low levels of vitamin E in the human body, it is necessary to establish a diet rich in this substance. It can be found in food like nuts, egg yolks, whole grain, and green leafy vegetables. Other good containers of this vitamin are peanuts, soybean, corn oi, and sunflower seeds. 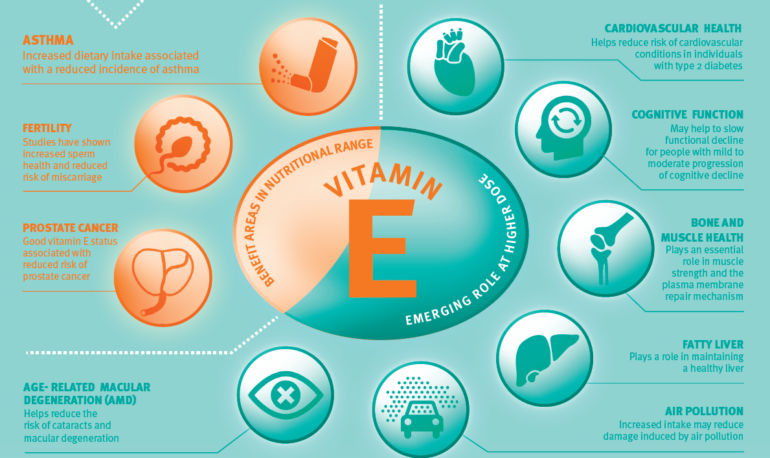 With the right diet and a watching behavior on any of the signs and symptoms described on the previous line, the insufficiency of vitamin E can be stopped and it will help to turn the body healthy once again.